aknowledgeableperson wrote: "If a motivational speaker at Municipal Auditorium is the worst it gets, then it can't be that bad." It was that traffic for the event along with the morning rush hour traffic. Traffic was more or less at a standstill. Not sure how the traffic was in the NE part of downtown but the west and south was a parking lot. Traffic backed up on the ramps off the highways. So I would say that was bad. Situations like that are daily if not hourly occurrences in most big cities, even some cities the size of KC. KC is blessed with a very adequate road network even though its citizens may not believe it. While I would not think the situation you described as being terribly problematic after nearly 10 years in Houston, I suspect it's quite annoying if you are use to traffic being essentially on the move all the time. The Star's poll showed a lot of opposition to a downtown stadium (although it was closer than the Star made it sound) for precisely these reasons (traffic/parking). Highlander wrote: And no one is talking about St. Louis. That stadium has always been downtown. the cardinals have played in a non-downtown stadium for more years than they have ever been downtown, including a non-downtown busch stadium....for decades longer than the royals have even been in kansas city. They've been there over 50 years - not forever but a very long time (and Sportsman Park was simply changed to Busch Stadium a few years before they moved - it wasn't built as such). The Cardinals arrived downtown in the 60's when downtowns across the midwest were struggling. As I've said, stadiums help but don't singlehandedly create development, they augment it but they aren't going to turn around a downtown in decline on their own. That said, there is a good amount going on around Busch now - it's not been a total failure at creating development and the rail line provides a non auto option that I certainly envy for KC. the funny thing is that i've probably been stuck in worse, choked down traffic leaving kaufmann than leaving downtown st. louis after a cardinals game, which sits on a street grid that has a ton of potential ways to leave including a bunch of on-ramps to four different interstates. an exception might be like playoff or world series traffic. i imagine downtown kc would be the same once the suburbanites figured out all of the alternate ways out. To highlander's point, Busch II opened in what, 1966? Essentially, the cards have been downtown forever in modern pro sports history. As a side note, I still miss those concrete arches around the top of that stadium - wish they had kept some and done something with them around Busch III. Also wish Busch draft beer was possible to still find in the new stadium - if you can, tell me where! 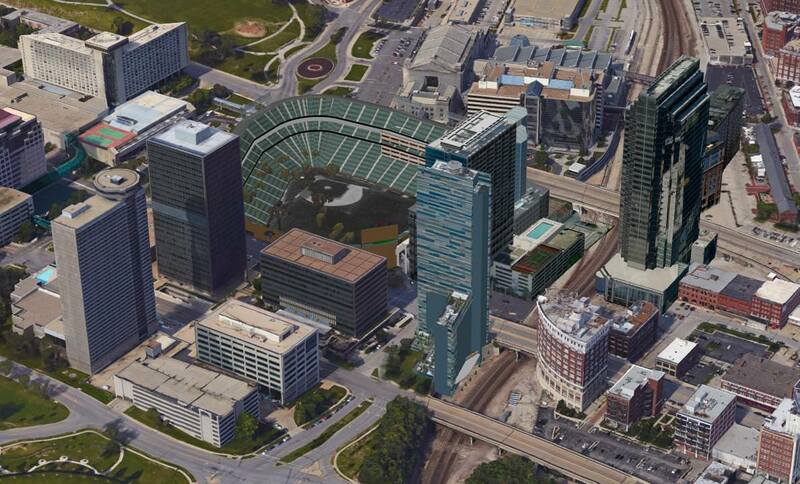 Obviously I'm all for a downtown ballpark in KC, but have mixed feelings about waiting until 2030 for it. By that point, Kauffman will be genuinely historic, and even more of a unique, mid-century design. The location, however, will no doubt still be awful, despite the presence of Dixon's Chili Parlor and Cool Crest in close proximity. Such an interesting scenario we have in KC - aging stadia that have been and are still considered best-in-class (or close), that would no doubt become classics if used and tastefully updated continually, that are located in (IMO) one of the least appealing locations in the metro area. The parking lots are wonderful for tailgating, but agree with Warwickland that leaving TSC can be a major pain now that they are funneling all traffic out to defined exits, and EVERY SINGLE CAR is getting onto 435 back to JoCo, while some of us just want to sneak out a back route to Raytown Road and on to midtown. Jurassic Park (E side of downtown Loop) would be a good place if not North Loop. And it may encourage a streetcar line along Indep Ave.
silver lining - maybe the cheaply designed/constructed "throwback" stadia will be out of fashion by the time kc builds a downtown stadium. i mean if you take minneapolis as an example it already is. i am nostalgic for busch II and older stadiums like that (i guess kauffman is the last of that generation)...i've always said thought that i would love to have had kauffman in downtown st. louis, with generally the same sightlines as busch III. it would be kind of cool to sort of echo kauffman instead of like mimicking 1908.
about busch draft...sometimes its hard just getting a budweiser (HEAVY)! all of these BUD SELECT DADS from ballwin are outnumbering the southside geezers. Turdbird and Bushleague stadium talk out of this thread now! I demand a mod cut/safe space. twist on this time could be two converging prospects....the ULI-endorsed evacuation of I-70 and Amazon HQ2. removing the hwy allows for parking and bus ingress for a stadium above/adjacent on the lovely concrete mass just south of I-70. And giving Amazon naming rights is unlike any other city's proposal n'est ce pas? win-win-win = 50,000. And anyone who doubts the renaissance opportunity locating a stadium downtown needs to visit Coors Field. Planning starts now. Think bigger KC. And no, plopping down a stadium, or any placemaking effort, should not be taken lightly. It takes an understanding of what is, what can be, and what makes it so. Look at Minute Maid stadium in lovely houston. Nada for redevelopment b/c it was not in an area that was, could be and nothing can make it so. Ughfest. I fear the same for East of downtown. just b/c you can doesnt mean you should. concrete mess separated by government vacuum. 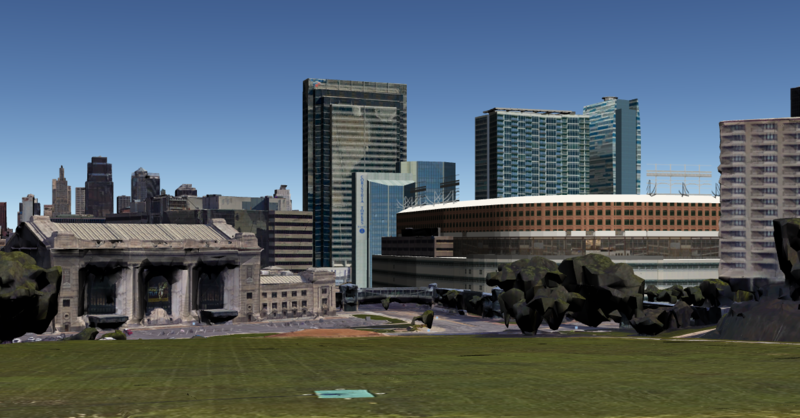 and shoehorning it next to Sprint center is just wrong, so is tearing down a functioning gov't bldg. think egress, think walkability, dont ignore the people mover, think what is, and maybe it can be. ToDactivist wrote: Look at Minute Maid stadium in lovely houston. Nada for redevelopment b/c it was not in an area that was, could be and nothing can make it so. Ughfest. Must not have been to Houston in several years. their parking is to the SE so I'll exclude that side. No, development has not got to the North of it yet, but to say there's nothing is provably false. Partially true. I guess by development I meant walkable amenity/F&B thingys not glass towers across and servicing the convention center. And am aware of the new streetcar line - if used. The consideration for a stadium is well documented by ULI and others but still some magic in that selection. Please let me know what you think of this. Suggestions are welcomed. I could make something like this for the Northloop as well. The stadium itself is very similar to Wrigley in Chicago. A lack of horizontal space is combatted by moving support areas and such(kitchens, dinning rooms, etc) below grade. The site has a lot of below grade space that can be utilized for such purposes. I removed the game day plaza to allow for more seating and hotels/apartments/office spaces and associated spaces. Every potential revenue producing space must be capitalized on inorder to make the financing for this project work. 1. The land is already owned by KCMO and Union Station. 2. No highway removal is required to get this going, unlike the northloop site. 3.The parcels included in my plan are hard to activate, unlike the North loop which would already have been built on by now. 5. I believe a Northloop stadium would turn into a sprawling suburban site in a prime downtown location. 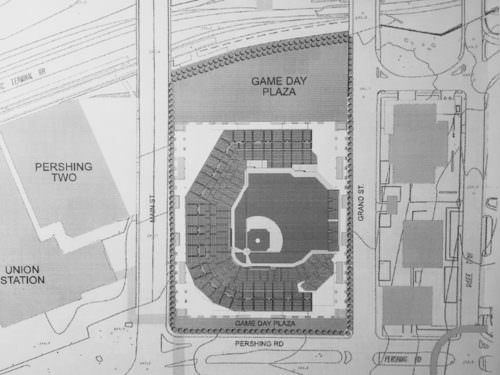 The limitations of the Washington Park site make sure the stadium and associated structures do not sprawl. Worries: Traffic is definitely a concern at this site. Main should be closed to cars on game day to 1. preserve streetcar performance and 2. serve as a sort of pedestrian zone. This plan relies on a streetcar expansion, bussing, and hopefully LR to make the car problem manageable. But seriously though, good job on the renderings. It’s clear you put a lot of time into it. I’m not a fan of the idea itself though. The idea of a stadium at the bottom of liberty memorial’s hill really seems to be in bad taste. The WWI museum is one of only like 4 things in this city that I’d consider truly world class, so we should treat it with incredible respect. Also, city hall should be visible from it. Speaking of views, the baseball field has none, which negates one of the benefits of having it downtown. Maybe turn it to face the memorial or union station or something. Or shrink some of the high-rises so you can see the skyline. Thanks James. Haha it’s all good. Was just trying to see what you showed me would look like if built. Fantastic job. I wish KC had the vision to something like this but this place is almost hopeless. This is what real cities do - they go big and make it happen. This plan doesn't detract from the Liberty Memorial in any way at all. If anything, the WWI Museum would likely see far more visitors if this happened. Look for some one to claim that he can't see City Hall from this plan so he's against it while screaming "shrink, shrink, shrink!". Then he'll cheer lead like a rabid dog for a north loop location, never realizing that he "won't be able to see City Hall" from there either. The north loop would be the worst place under the sun to place a stadium - it would turn into a suburban shitfest literally overnight. Drive-thrus would pop up everywhere, as fast as City Hall could rubber stamp them. Damn, looks like a real city. Keep dreaming. A downtown stadium will not happen.